At NewChurch we know you want to feel connected to God, and that you're living a life of purpose. In order to do that, you need a church you can believe in and a community you can belong to. The problem is sometimes religion seems lame and irrelevant which makes you feel disconnected from God, isolated and without a sense of meaning. this chaotic and lonely world. Church will never be a waste of time. Instead it will be enjoyable and engaging—the music will rock. Preaching will be relevant, practical and true to God's Word. Everyone is welcome and will be treated with love and respect. We won't judge you as if we don't need God's grace, too. We will help you make sense out of the world. You will leave with more joy and more hope than when you got here. These promises are based on God's faithfulness and not anything we bring to the table. Who along with the Father and the Spirit will be praised and glorified. A way to find meaning, joy and hope. Learn while you drive, workout or mow your lawn. We get together at 10:00am on Sunday for worship. The service is about an hour and fifteen minutes. For the first half, all ages stay in together for a classic rock flavored time of praise—we sing about who God is and what He has done. At the halfway point the YoungOnes are dismissed to age appropriate teaching while the rest of us gather around God's Word. This is a modern worship service but expect there to be many ancient elements—the experience will be clearly focused on revealing how Jesus both challenges us and comforts us with His promises. After the service, we hang out for a couple hours eating and drinking with our friends. Bring whatever you want to enjoy—fun for all ages—there's a big play area for the kids. We also have Sunday School at 9:00am for adults and youth, with child care provided. 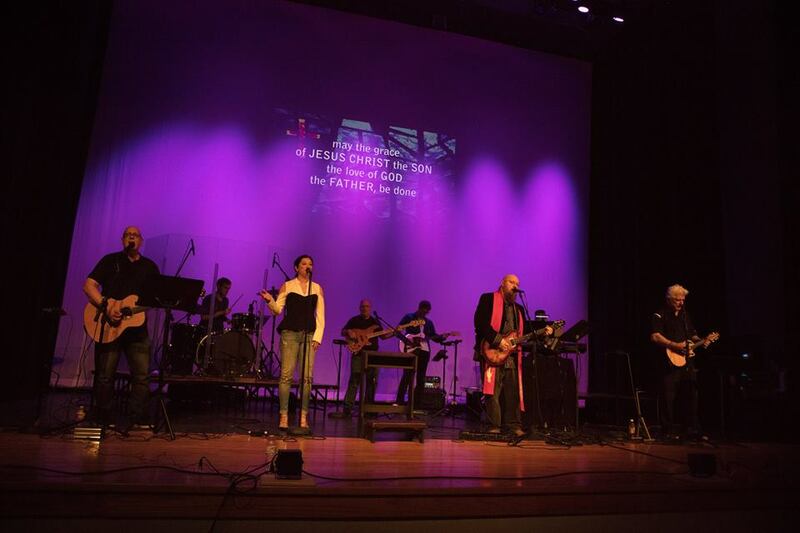 Worship God—Excellence in Worship: We glorify God in such a way that all people can understand who Jesus is—the hope and life that is only found in Him, and that He is the only way to the Father. The worship experience is accessible to the uninitiated, but also invites people to transcend their current understanding. Every effort is made to reduce the “awkwardness” that may make a guest or unbeliever feel they do not belong here. Come and see! Love People—Making Disciples: We believe our lives must be dedicated to both transformation (becoming more like Jesus) and sharing God's love and grace with others. We exist for both the people who call NewChurch home and the people who have not joined us yet. The Holy Bible is taught in all of its depth and richness, pointing to the true Word revealed in Jesus Christ. Join us! We believe going to church should never be a waste of time and ought to be something you and your family look forward to every week. We understand what it feels like to drag yourself (or your kids) to church which is why we started NewChurch in the first place. If that makes sense to you: JOIN US THIS SUNDAY morning for a great worship experience, GET CONNECTED to God and everything He has for you (via small groups, serving, podcasts, events, and more), and FIND PURPOSE by focusing on living a life of meaning, hope, joy and love. So, JOIN US THIS SUNDAY so you can stop wasting your Sundays and instead get connected to God with a sense of purpose through the power of a local church.